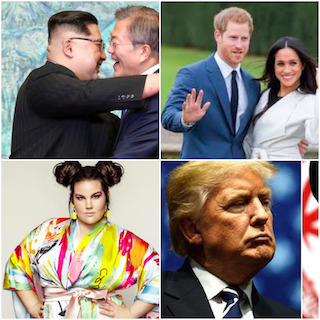 Tel Aviv: Event organizers were left alarmed and red-faced after a logistical error scheduled the North-South Korea summit to take place in Jerusalem, the royal wedding for Tehran, and next week’s Eurovision Song Contest to be switched to Pyongyang. The Royal Family will arrive in Iran under armed guard on Sunday for the upcoming nuptials of Everyone’s Favourite Ginger with his Hollywood Bride, Fred….. I mean Meghan. The actress from Suits. Street parties and public executions will be accompanied by canapés at 5 PM, while Camilla Parker-Bowles will be sent home strapped to a nuclear warhead later that evening. After honeymooning in Ramallah, the couple are expected to settle in a terraced house in Bognor Regis. Meanwhile, flights to Portugal for Eurovision 2018 were rerouted to the North Korean capital of Pyongyang after global air traffic control was hacked by first graders in Moscow. All songs considered too liberal, cheesy or colourful are to be censored by State TV with the 15-hour show to instead broadcast ‘Gangnam Style’ on loop, followed by reruns of M*A*S*H.
Donald Trump and Monsieur Macron issued a joint tweet from a fancy hotel room on the Champs Elysees: (#worryingtimes #LoveWins #MelaniaWho? ), and then The Donald vowed to reduce world tensions by moving the Embassy to Western Samoa.